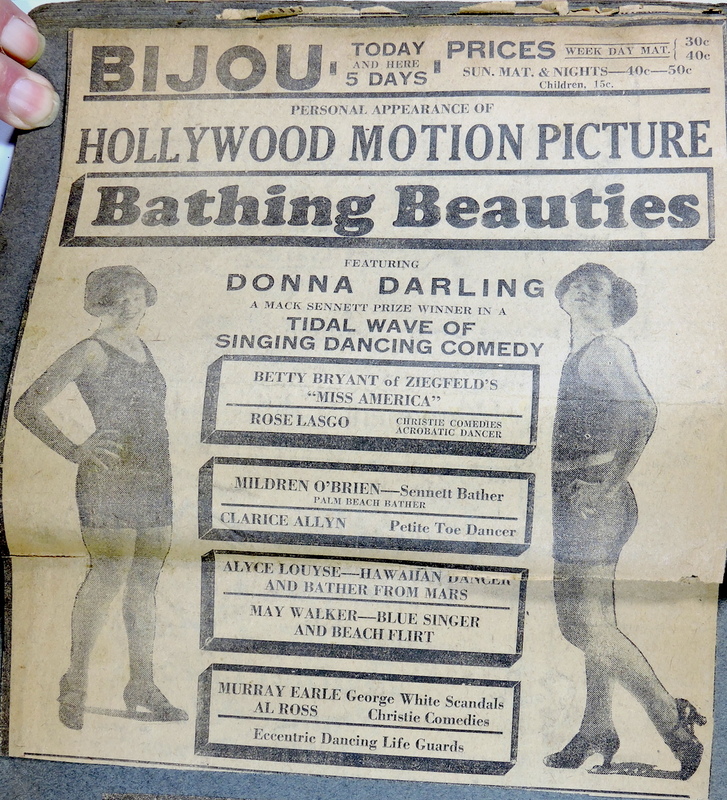 Category: Donna Darling & Co.
Donna Darling Collection – Part 26 – 23rd St.
For this week’s Treasure Chest Tuesday, I looked at several clippings from the same page of the Donna Darling Collection. Two of them relate to the 23rd Street Theater, One to the 125th Street theater and three mini-clippings that seem unrelated. 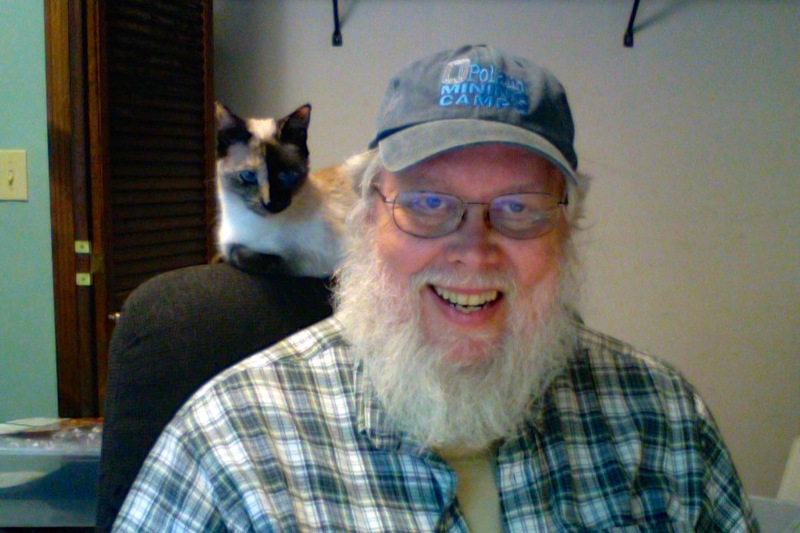 Cropped & resized for the web. Donna Darling is a blond miss of fair voice supported by two male dancers in a neatly devised offering enhanced by colorful hangings. The opening in “one” before a gold and black drop includes “Tell Me Pretty Maiden” and Silver Lining,” followed by a Pat Rooney impersonation by one of the boys. The parting of the curtains discloses attractive full stage hangings following the gold and black color scheme, the featured member appearing in a crinoline gown, for bits of old-fashioned numbers, including piano playing. The turn drags at the point, especially with the first old-time songs. The boys return in Colonial costumes for a minuet by the trio, followed by a soft shoe and jazz stepping by the male team. 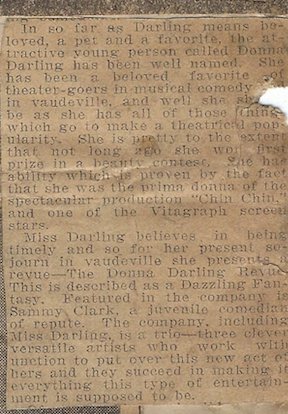 Miss Darling then offers a light operatic number followed by a solo stepping hit by one of the boys and a triple tin soldier and doll specialty. A wedding number with one of the chaps as the minister tops off the turn. The act is a flash for the three-a-day. At times chances for the bigger houses are displayed. The male dancers display ability with Miss Darling, securing fair returns vocally. The turn is running over time at present. With some pruning should improve materially. … Donna Darling and Co. (New Acts) were the proper kind of a flash for the closing position, holding the audience and securing applause returns. There was nothing in either article that suggested where the 23RD St. theater is nor when the show played. 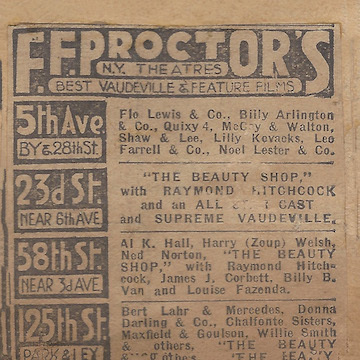 At the bottom of the scrapbook page was a small ad for F.F.Proctor’s. It shows that the 23rd St. theater is near 6th Ave. It also shows that Donna Darling & Co. was at the 125th St. Theater between Park and Lexington. I was a bit confused, because of the differences between the 23rd St. and 125th St. theaters, but from the ads I knew they were New York. 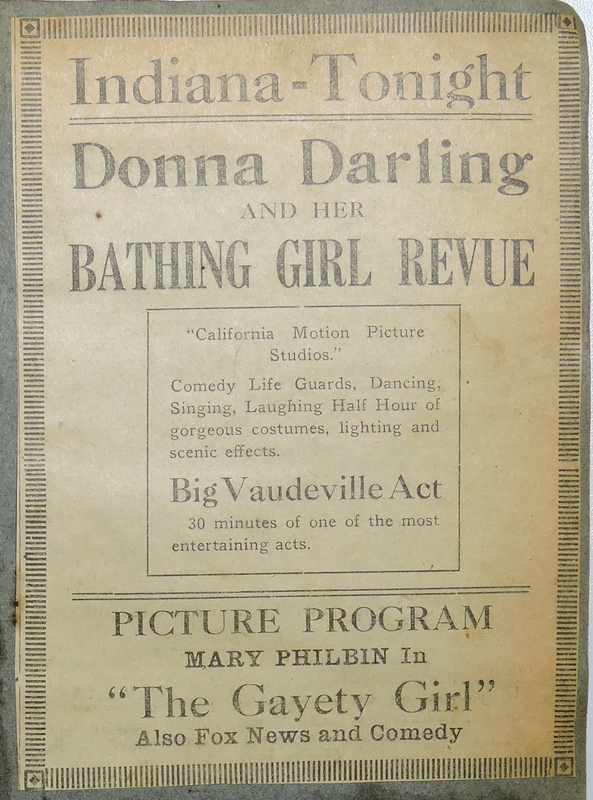 Also, Donna Darling & Co. was a 1922 production. 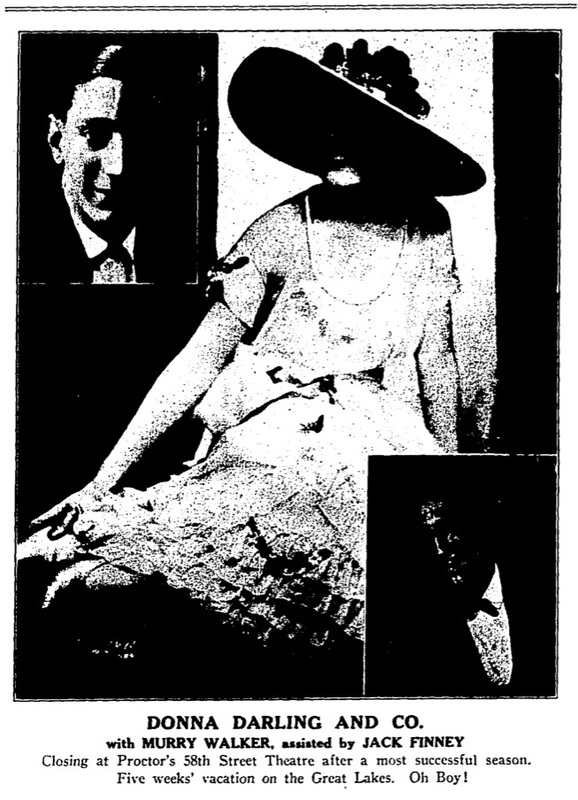 I began searching Newspapers.Com and quickly found the identical ad, in “The Evening World” (New York, New York) · Fri, May 26, 1922 · Page 26, which showed her playing at the 125th St Theater. This ad is really significant. 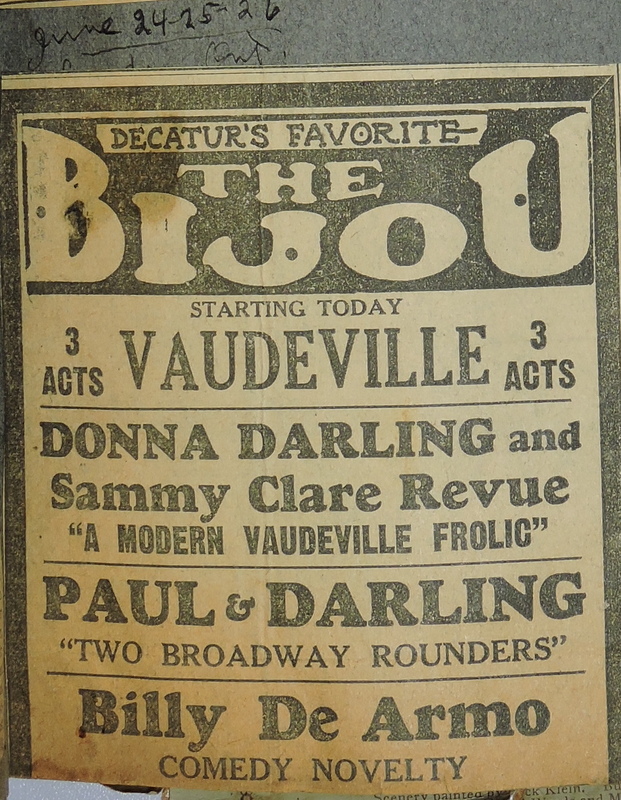 Family oral history says that once upon a time, Donna was proposed to by Bert Lahr, later famous for his role as the Cowardly Lion in “The Wizard of Oz.” This ad, suggests that Donna and Bert Lahr at least knew each other as they played at the same theater at the same time. 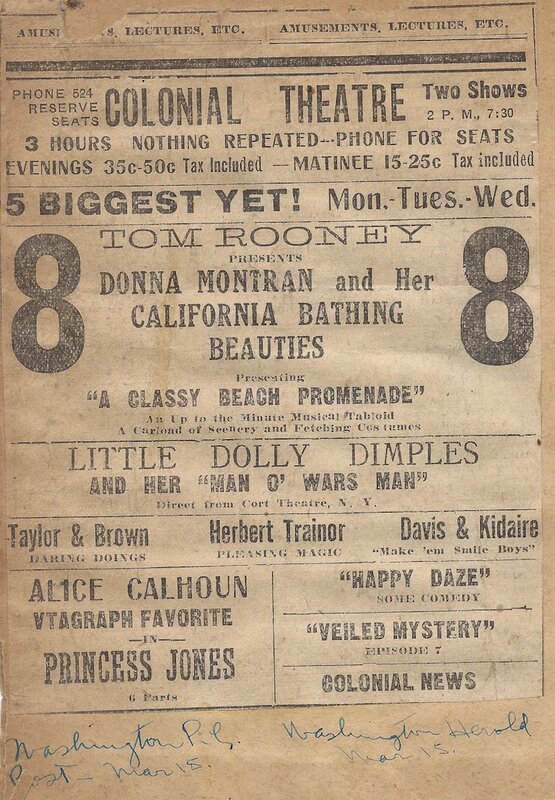 Then, using Elephind, I found, on the Illinois Digital Newspaper Collection (UIUC), The New York Clipper which on May 24, 1922, page 21, reported that Dona [sic] Darling Co. played at 23rd St, the first half of the week of May 22nd . 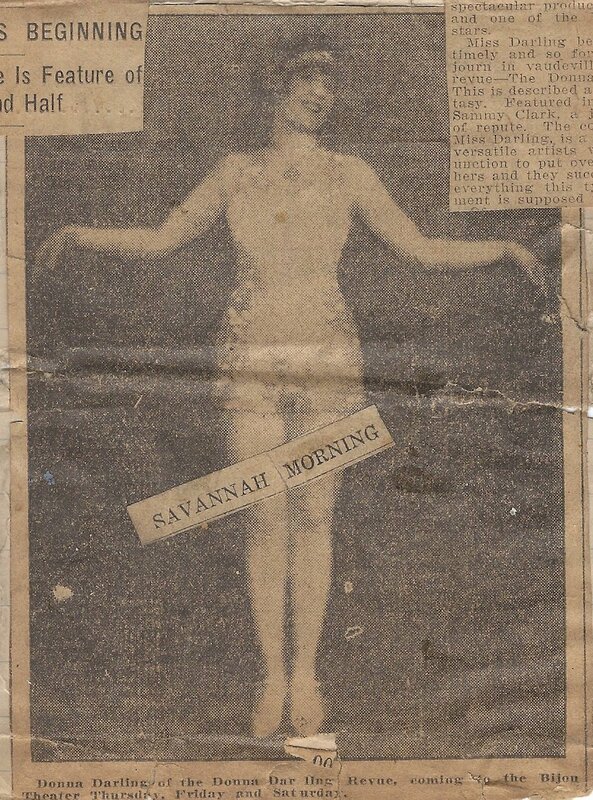 The Clipper also reported that Donna played at B. F. Keith Vaudeville in Jersey City the first half of the following week (May 29th thru 31st). Donna Darling and Company had a neat offering. 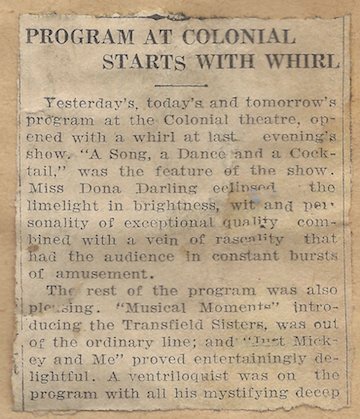 Miss Darling is dainty in looks, manners and voice and in her routine of songs showed herself thoroughly conversant. In the “My Hero” number she evidently lacked confidence but regained her composure in short order for the rest of the act. In old fashioned crinoline costume, she sang portions of old song favorites and finished with a brief session at the piano. The company, consisting of two clever young men dancers and singers were dressed appropriate to the period. Miss Darling looked best in pink, and in the wedding ceremony showed clever footwork in eccentric dancing, also in the mechanical toy dance, in which Miss Darling was a lively doll. The June 7th Clipper adds a lot to the story. It includes a picture of Donna, Murray Walker, and Jack Finney and a caption that they closed Proctor’s 58th Street and are taking a 5-week vacation. The newspaper copy image isn’t very good, but it is something. It suggests that Donna Darling & Company played Proctor’s 58th Street from June 4th to June 6th. Donna Darling left for Detroit, her home town, this week, where she will undergo an operation for the removal of tonsils. Murray Walker is leaving for Canada this week for a month’s rest. Jack Finney is going to Philadelphia this week to visit his folks for a month before reopening with Donna Darling. When I was young, I was often plagued with tonsillitis. Removal or keeping tonsils seems to have undergone sweeps each way. Some years they were kept if at all possible, other years they yanked them out. I recall talking with Donna and my mother about my tonsils and I remember Donna saying hers had been removed and it was no big thing. But we were poor and had no health insurance, so I kept mine. But back in 1922, Donna was 29 years old, and doing well. So, even though she was older than typical, she had her tonsils removed — maybe they were affecting her singing. Discovering four more venues for Donna’s career is a good week for research. Being reminded of her tonsillectomy and learning that she actually did take vacations during her vaudeville years was good to find out. And finally, confirming that she actually would have known Bert Lahr, and the story of his proposal to Donna might be true, is priceless. 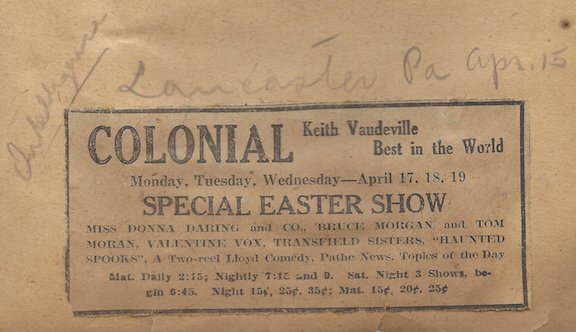 May 29-31, 1922 – B.F. Keith’s Vaudeville, Jersey City, NJ – Donna & Co.
June 4-6, 1922 – F.F. Proctor’s 58th Street Theater, New York – Donna Darling & Company. 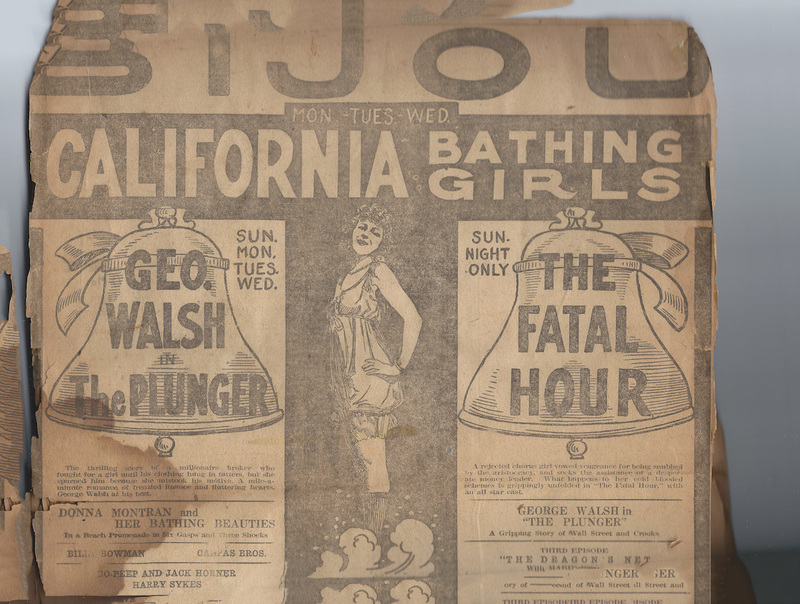 June 7 until about July 10, 1922 – Vacation. Donna has tonsils removed. Oh, and while searching I found one more venue for Donna’s show. From March 30th to April 5th, 1922 – she played in Pittsburgh-Johnstown. I’ll bet, when I have a chance to research more, I’ll find that Donna played at the 5th Avenue Theater. Probably May 25th thru the 27th. Just guessing, but it would fit the pattern. Author Don TaylorPosted on April 5, 2018 March 17, 2018 Categories Donna Darling & Co., Donna Montran, Treasure Chest Thursday, VaudevilleTags Brooklyn, Donna Darling, Harlem, Jack Finney, Manhattan, Murray Walker, New York, Proctor's 125th Street, Proctor's 23rd Street, Proctor's 58th Street, VacationLeave a comment on Donna Darling Collection – Part 26 – 23rd St.